Free Postcode Lottery isn’t going to win over lottery aficionados any time soon, but it does offer a unique lottery experience. It’s not everyday that an online lottery site manages to be a delightful surprise while also falling a bit short in several key areas. 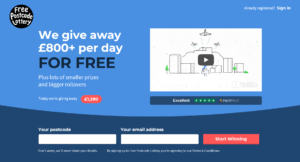 Free Postcode Lottery offers a unique proposition: provide your postcode and email address and stand to win money daily! Unfortunately, there are various trade-offs—such as its exclusivity to UK residents and the small prizes on offer. It is free to join but is it really enough to win you over? Let’s find out! Free Postcode Lottery offers 6 games—or draws—in total, but if you’re expecting games like the US Powerball, Mega Millions, or the like, you’re going to be disappointed. Technically, Free Postcode Lottery only offers 1 main game, aptly called the “Main Draw.” To enter the Main Draw, you simply provide your postcode and email address and you’re good to go! The other 5 games are simply bonus games that require additional actions for players to qualify. Video Draw: To qualify for draws, you must go to the Video Draw page and watch a video clip. Prizes start at £100. Survey Draw: Just as the name suggests, players must answer a survey to qualify for a draw. Prizes start at £50. Stackpot: To qualify for the Stackpot draw, you only need to visit the page—no need to view videos or answer surveys! Players stand to win £10 twice daily, at 9am and 9pm. Bonus Draw: The Bonus Draw works differently than the rest, and it requires more effort from players. 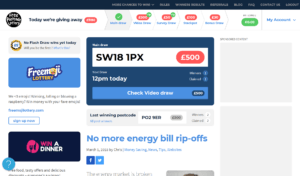 You get 1p bonus per day for simply visiting the website, checking out the pages for the Main Draw, the Video Draw, and the Survey Draw, making referrals, and completing offers on the Bonus Draw page. Once you reach certain milestones, you can then access the £5, £10, or £20 Bonus Draws. One important thing to note: the bonus is only added to your winnings when you win a prize from any of the draws (except the Flash Draw). Flash Draw: The Flash Draw is a unique instant win game that gives you the chance to win £5 every day. To win, players must find a unique image that randomly pops up on ad slots found throughout the site. If you happen to find one, simply click on it and in 7 days, your prize will be sent to your PayPal account. No need to deposit anything here (it’s FREE, remember? )—just make sure you have a PayPal account, so you can receive your winnings! Free Postcode Lottery doesn’t pay winnings through bank transfers or any other method, so make sure your PayPal is set up correctly before you join a draw. Just in case you don’t have a PayPal account, Free Postcode Lottery can also send your prize via Amazon E-Voucher. It’s a good alternative, especially if you’re an avid Amazon shopper. However, if you want to withdraw your prize to your bank of choice, I suggest you use PayPal instead. Is Free Postcode Lottery Safe? For a free lottery site, Free Postcode Lottery is surprisingly safe. But don’t take my word for it! Free Postcode Lottery is highly rated in TrustPilot, where 91% of 1,719 customer reviews agree that it is a trustworthy lottery site. As far as security measures go, the website makes use of SSL encryption to ensure that your personal information—in this case, your email—is safe. Believe it or not, malicious individuals can still wreak havoc on your life using just your email, so it’s great to have the additional peace of mind that come with SSL encryption certificates. Free Postcode Lottery provides ample customer support. Given its free-to-play nature, I didn’t expect Free Postcode Lottery to provide in-depth help materials and a variety of live support channels. This isn’t a traditional lottery site, after all. That said, I was pleasantly surprised to see that their FAQs tackled just about everything you need to know about their website—from registering to claiming winnings and more. And if you have a question or issue that self-help measures can’t solve, you can easily reach Free Postcode Lottery via an online contact form. 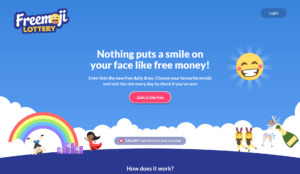 Since Free Postcode Lottery is exclusively for those who live in the UK and any other area using the British postcode system, Freemojilottery was created so people in other parts of the world can have a similar experience. It works in a similar fashion to Free Postcode Lottery, except for the fact that you don’t use postcodes to enter a draw. Instead, players simply pick a set of 5 different emojis to enter. If your combination of emojis get picked in the daily draw, you win! Prizes vary depending on the draw but don’t expect anything astronomical. They also offer a bonus draw called the Fivers Draw. In this draw, players who are entered into the Main Draw are also entered. 5 winning combinations are picked on a daily basis, where each combination is worth $5. Creating an account with Free Postcode Lottery literally takes less than 10 seconds. It’s that easy! Visit the website’s landing page. Click on the red “Start Winning” button. It must be noted that once you register your postcode and email address, you automatically get entered into their daily draw. No need to do anything else—unless you want to play in the additional draws I mentioned earlier, that is. While playing is easy, it takes a bit more effort when it comes to claiming prizes—but it’s all part of the fun. Players need to keep checking Free Postcode Lottery daily to see if they’ve won. If you win, you’ll see a “collect” button that initiates the payout process via PayPal (or, as I said before, via Amazon e-voucher if you don’t have PayPal). All winners have 24 hours to claim prizes, so if you win but missed the announcement on their website, say goodbye to free money! Don’t worry though. Free Postcode Lottery sends out daily reminders, so you don’t forget to check the winning postcodes. If you do happen to win but forget to claim your winnings, the prize will simply rollover to the next draw until somebody wins. As for shared postcodes (i.e. for people who live in the same house, apartment, compound and the like), winnings will be equally split among those who successfully claims the prize. Finally, all players are entitled to one entry each for every draw. Creating multiple email addresses to register multiple entries is frowned upon by Free Postcode Lottery. If they detect any such activity, the offending player will be disqualified and banned indefinitely, so don’t even try pushing your luck! The Bottom Line – Should You Use Free Postcode Lottery? If you live in the UK, Free Postcode Lottery could be a fun way of passing a few minutes of your time each day. The website is ridiculously easy to use and qualifying for a draw takes only a few seconds. Plus, you get the chance to win more money thanks to the additional draws. That said, it’s not for those who are serious about lottery. Traditional lotteries of any kind, such as the US Powerball or Mega Millions, are nowhere to be found. 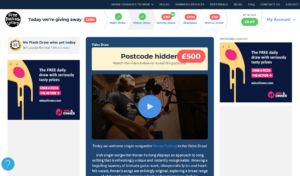 Free Postcode Lottery only offers its own proprietary lottery game—one that is powered by British postcodes and advertisements. It is a fun, charming time-waster, but players looking to win big should look elsewhere. But hey, why not reconsider? It’s still free money, after all. Free Postcode Lottery is a unique lottery site that throws everything you know about online lottery out the window. It was founded by Chris Holbrook, a web developer who isn’t fond of lotteries and gambling in general. An “anti-gambling website” according to Holbrook, players don’t risk any money to win. Entries are 100% free and prizes are paid for by advertisers.